NEWBORN size. Age: 0+ (up to about 12months) SIZE: outer measurements 20x31", mattress: 12x28"
Middle size. Age: 3+ (up to about 24months) SIZE: outer measurements 20x35,5", mattress: 14x31,5"
Toddler size. Age: 6+ (up to about 36months) SIZE: outer measurements 23,6x45", mattress: 15,7x39,4"
All MATERIALS are certificated, hypoallergic, breathable and non-toxic. Cover fabric is 100% cotton. Inner mattress is 2cm foam in the cotton cover. Bumper filling is polyester fibers - breathable insulation for kids clothing. Baby can sleep all night long in my nests. ★Great idea for the transition from mom's abdomen to cot. 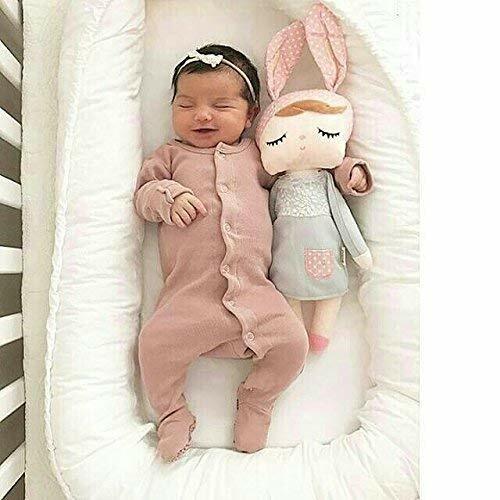 ★ You can put in the baby nest between you in your bed, without any worries to make a harm for a little baby while sleeping at night♥. ★Or just put the baby nest in the crib or bed. ★You can use it as a changing or playing math. ★Take the babynest in the pram or while traveling. Always a safe and secure feeling. Tip: do not walk around with your baby in the baby nest and place always the nest on a flat surface!